Pyrex was introduced in 1908 by Corning Inc. as a line of clear borosilicate glass used in the laboratory or in the kitchen. Its multifunctional use and ability to withstand a high heat made it incredibly popular for home cooks and universities alike. The history of Pyrex highlights female ingenuity and the American homemakers around the country who helped bring Pyrex to the front and center of kitchens nationwide. In fact, it was a home cook that discovered Pyrex's usefulness in the kitchen. Bessie Littleton was the wife of a physicist at Corning Glass Works. One day, she baked a small sponge cake in a sawed-off battery jar made from Pyrex that was used in the lab. Her experiment proved Pyrex could go in the oven, and after that, history was made. In the 1930s and 1940s, the company began to produced opaque temperated soda-lime glass, and the fun Pyrex patterns you know and love began. We've covered just how expensive vintage Pyrex is nowadays, especially when sold through crowd-sourced sites like eBay. Now, we're taking a look at some of the most popular vintage Pyrex patterns. If you have any of these in your own kitchen, know that they are certainly in high demand. Originally known as the Hot 'N' Cold Chip and Dip set, the Eyes pattern was produced between 1950 and 1959. The chip and dip set included two round bowls, one smaller and one larger. Not all Eyes pattern pieces have the Pyrex stamp, but these models feature the classic white opal glass and turquoise print that collectors love. Talk about Pyrex passion; this is one of the more expensive vintage Pyrex dishes, especially if the mixing bowl set comes together with the dip bracket. The balloon design was also part of a chip and dip set that was produced in 1958. The white-on-turquoise featured a pattern of hot air balloons and other sky objects. The bowls could be used as Pyrex mixing bowls, serving bowls, or for baking. Many Pyrex users even used this pattern as a punch bowl for parties. Produced from 1956 to 1963, the Pink Daisy pattern was debuted alongside a winter class, Snowflake. They were the first Pyrex patterns printed on a solid color, and the multiple casserole dishes with lids made them one of the best-selling patterns. Today, you can find the vintage dishes on eBay in this pattern, and the brightly colored pieces are a real draw for Pyrex collectors. The space saver vintage Pyrex casserole dish is a hot seller that fetches big bucks, especially if in perfect condition. Before geometric designs became big Pyrex sellers, the Snowflake and Daisy patterns were the first of their kind. Produced from 1956 to 1967, the longest running pattern was snowflakes on a turquoise Pyrex background, while there are also versions of turquoise snowflakes on a white background. The Pyrex lids for the casseroles could be used as an extra serving dish or as a trivet, a feature that the saleswomen for Pyrex pushed during their showings across the country. The space saver design made it an easy fit into most kitchen cupboards, and soon as Pyrex dishes were available in that spacious style. One of the most popular Pyrex patterns of all time, the Dot collection was released in five distinct colors from 1969 to 1973. The first three colors released were red, blue, and yellow. In 1969, green was added, followed by orange. The nesting mixing bowls featured above showcase how important storage was to Pyrex developers. These vintage Pyrex bowls are a must-have for any Pyrex enthusiasts, and make an excellent refrigerator dish to store prepped ingredients. The primary colors of the Dot pattern, also known as the New Dot, showcase the design interest of America in the early 1970s. You can find single bowls for much cheaper on eBay, but to find an official set, you'll pay a pretty penny. 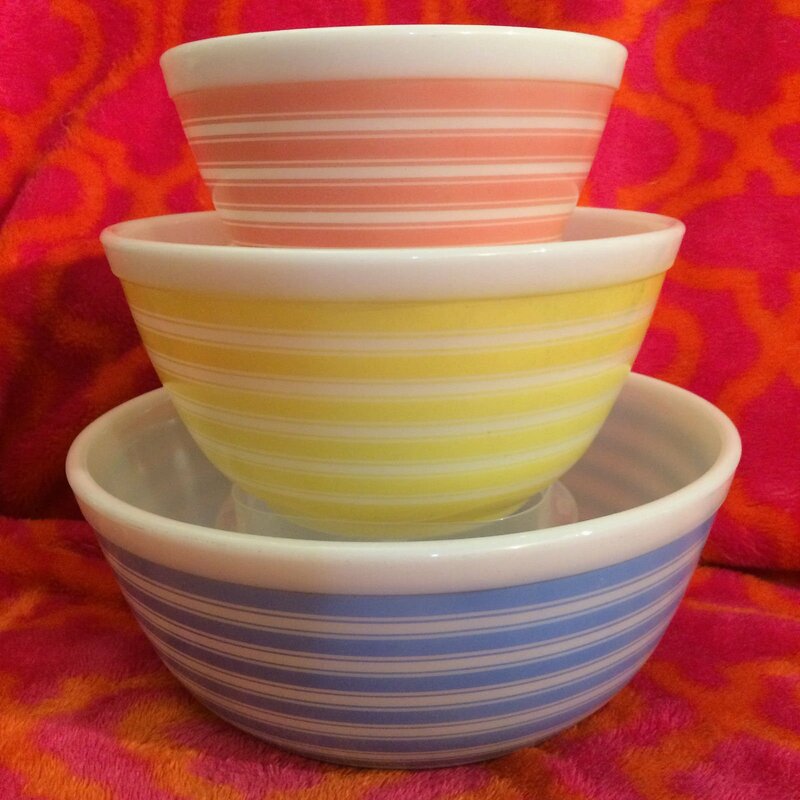 Produced from 1965 to 1987 in four colors, the Rainbow Stripes pattern were originally released in specific color sets. Blue, pink, sandalwood, and yellow were the color combinations, though yellow was the only color that needed to be bought separately. Collectors can build a 64-set nesting bowl collection of Rainbow Stripes from the different size mixing bowls. Now, a set will run you a pretty penny, but many single bowls are available for reasonable prices. Produced from 1964 to 1965, William Curtis designed the Terra pattern and even won an award for his concept. Unfortunately, the cost to continue producing this intricate pattern was too high and it was discontinued after only one year. However, the earth tones were well ahead of its time in the mid-1960s and found a home in many 1970s design motifs later. The pattern was produced in a mixing bowl set, a Dutch oven round casserole dish, along with a mixing bowl. While this collection for sale on eBay is for the entire complete collection of four nesting bowls, a 12-piece casserole set, and an 8-piece refrigerator set, it still fetches a pretty penny. Produced from 1957 to 1966, it was one of the first four printed patterns released on opal Pyrex. Since then, color iterations expanded to include pink on white, black on yellow, black on white, and gold on beige. The Gooseberry pattern became synonymous with the Cinderella nesting bowl, named for the handles on each side. Again, this price point is for the entire Amish Butterprint collection of both white on turquoise and turquoise on white. Produced from 1957 to 1968, Butterprint was one of the first printed patterns following Snowflake and Daisy. The Amish print is still today considered classic Americana, and is certainly one of the most recognizable Pyrex products and prints out there. Consider Lucky in Love the Holy Grail of Pyrex collecting. If you ever spot this pattern in the world, you better snap it up for a good price. While there are none currently available on eBay, the last known piece sold for over $4,000 in February 2015. What makes Lucky in Love so special? It was most likely a test piece or a limited release item since it was only produced in 1959. The rare design features green grass with clovers, accented by pink hearts all over the dish. The Corning Museum of Glass owns the ultra-rare single clover print sans hearts.